DOOM! DOOOOOOM! DOOOOOOOOM! Not just a catch-phrase from a delightfully twisted cartoon that was clearly years ahead of its time, but also the title of one of the most legendary games ever made. Pretty much everybody here grew up on DOOM, a first-person shooter which showed you that the only thing to fear was fear itself. And gigantic blocky demons from a pixelated hellmouth that had murdered your entire crew. And maybe a sequel to that adaptation that starred The Rock. Brrr, scary stuff. Thing is, video game visuals have apparently come a long way since 1993. Of course, visuals only take you so far. It’s all about the gameplay baby, which is why just about any DOOM is still actually fun to play these days. 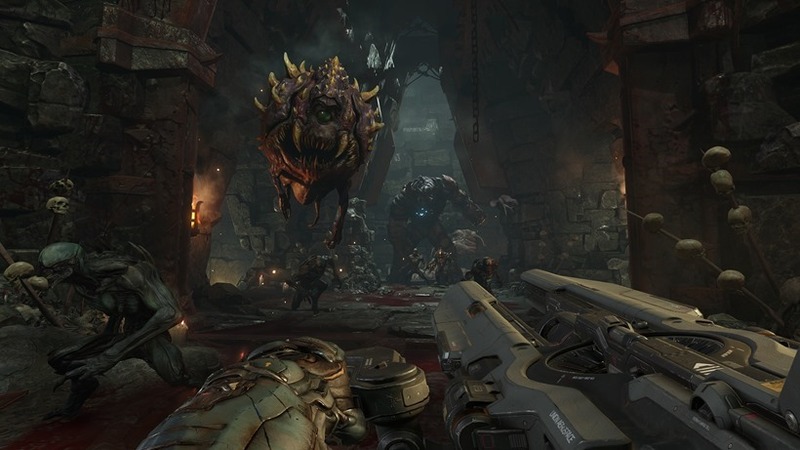 With QuakeCon on, impressions are coming thick and fast about just how fast and mad the multiplayer for DOOM is. GamesRadar describes it as a quick-paced descent into online kill-sprees because “Holy hell, is it fast”. There’s no run button because you don’t need one. Push forward, and you’re off, and you’re not going to slow down until you die. Charging in, pedalling back, strafing, it’s all as quick as lighting, and immensely gratifying with it. This is a game of aggressive, second-to-second strategy, not camping and cowering. It strips competitive FPS back to the basics. No cover, no complex interactions, no run toggle, just sprinting, double-jumping, shooting and deliciously brutal melee kills. Every player gets one special item (so far I’ve seen a frag grenade and a personal teleported), but that’s as complex as it gets. And that’s the kind of feedback that makes me happy. Much like my clothing, taste in music and the condom in my wallet, I’m still stuck in 1993. Now bring me my damn boomstick. Previous article This trailer for GOTHAM season 2 will break you! Next article Get your very own official MGSV… boots?